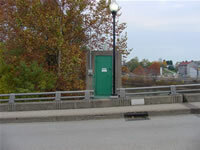 LOCATION.--Lat 40`01'03", long 79`35'38", Fayette County, Hydrologic Unit 05020006, on left bank at downstream side of Crawford Avenue bridge at Connellsville, 1.2 mi upstream from Mounts Creek, and at mile 44.0. PERIOD OF RECORD.--July 1908 to current year. Monthly discharge only for some periods, published in WSP 1305. GAGE.--Water-stage recorder. Datum of gage is 860.13 ft above National Geodetic Vertical Datum of 1929. Prior to Aug. 15, 1928, non-recording gage, and Aug. 15, 1928 to July 7, 1958, water-stage recorder at same site and datum. July 8, 1958 to Sept. 8, 1959, non-recording gage at site 0.4 mi downstream at different datum. Satellite telemetry at station. COOPERATION.--Station esablished and maintained by the U.S. Geological Survey. Funding for the operation of this station is provided by U.S. Army Corps of Engineers, Pittsburgh District, the Pennsylvania Department of Environmental Protection and the U.S. Geological Survey. REMARKS.--Flow regulated since 1925 by Deep Creek Reservoir, since 1943 by Youghiogheny River Lake 29.4 mi upstream, and by several smaller reservoirs above station. Supplied by NWS: Action stage-9 ft; Flood stage-12 ft; Moderate flood stage-16 ft; Major flood stage-18 ft.